HMS Rattlesnake was a 28-gun corvette of the Royal Navy launched in 1822. She made a historic voyage of discovery to the Cape York and Torres Strait areas of northern Australia. 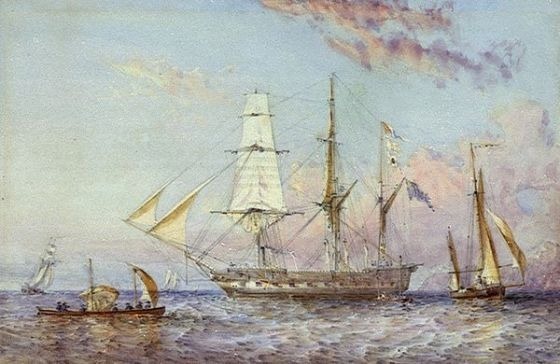 The reason I am mentioning Rattlesnake is that one of her sister-ships, HMS Samarang, surveyed Port Hamilton in 1845 by Sir Edward Belcher in the Samarang. Post Hamilton was named after the then secretary of the Admiralty, Captain W. A. B. Hamilton. I intend to post something about Port Hamilton in Korea in the future and the Samarang will be mentioned but I did not have a picture of her, hence the entry for the Rattlesnake.